My church does this thing that everyone should do. I don’t have “everyone should”s too often, but trust me: I think they’re on to something here. This thing is called Life Story Groups. In Life Story Groups, 3-4 people get together and meet 3-4 times, with each person taking a turn telling their life story. They can choose to filter out the hard stuff, but usually people take a chance on vulnerability and reap tremendous rewards from doing so. We meet at people’s houses, diners, wherever we’ll be comfortable without much noise. Life stories are considered absolutely confidential. During your life story, folks sometimes ask clarifying questions but there’s no agenda and no real conclusions — just nonjudgmental listening. And snacks. There are lots of snacks. Think about it. In general, people spend nearly all their time with one another relating on a surface level. Even when we get past small talk, we rarely have cause to delve into the corners of our soul with one another. It’d be awkward. We might be able to share hard times in a sanitized way, but we avoid telling the raw, whole truth. How do you tell someone about how bad it really is, when it’s bad? How do you broach that one night when it all fell apart? The year you hit rock bottom? The huge mistake you made? There’s just no comfortable lead-in to that, and maybe no one wants to hear anyway. Right? As a result, we can feel like we’re the only ones who have our particular struggles. We might feel alone, crazy, ashamed, frustrated with ourselves or our circumstances — why me? and why can’t I fix myself? What happens during these Life Story Groups is simple — storytelling, food — but what happens during these Life Story Groups is transformative. You discover that others also have raw, ugly places they don’t speak of — things they’ve hidden away from everyone and sometimes even tried to forget themselves. Our stories tie us together in intimate ways that we may never see because we don’t have the occasion to; Life Story Groups create an occasion. When I hear other people laid bare, what happens in me is a heart-opening: an increase in empathy, a desire to listen more, a desire to be a softer place to fall. When I lay myself bare, what happens is a convergence: all of my selves, private and public, get to be one. People look at me and see the real me. What would happen if you formed a little Life Story Group? What would happen if we all did? If we all rotated in and out of Life Story Groups, causing a ripple effect of knowing one another? Sometimes I think that heart change — the basis of home change, of community change, of nation change — is much more dependent on storytelling than we realize. I start another Life Story Group this Friday and I’m excited to get to know three other women I only just met this morning! 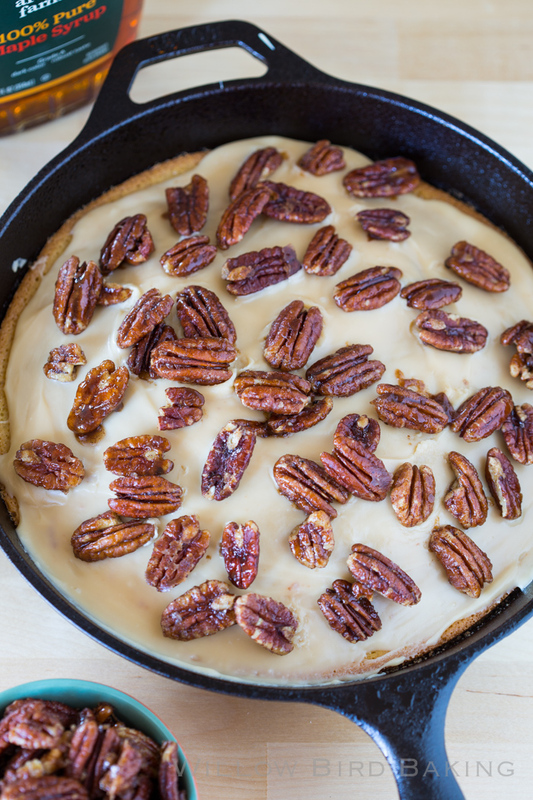 This cake would be a perfect treat for our gathering — a delicious yellow cake iced while hot with maple crackle icing and topped with addictive maple candied pecans. 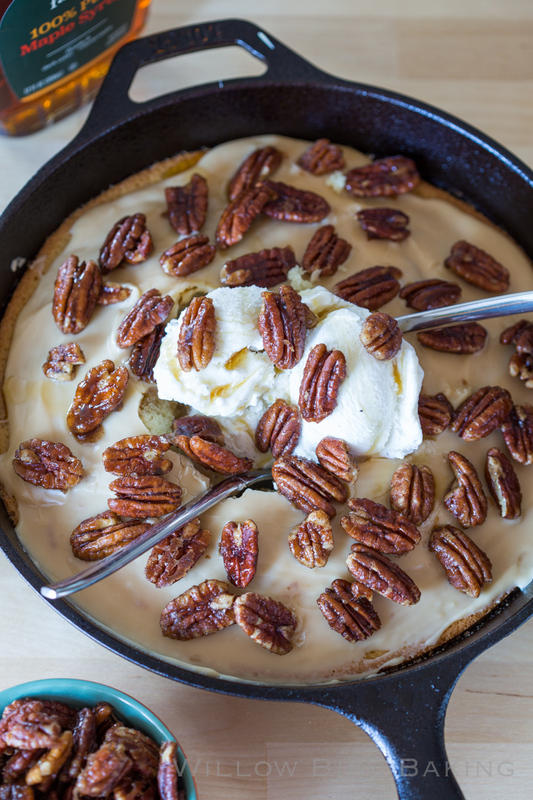 I serve it with vanilla bean ice cream and a drizzle of maple syrup right out of the skillet. Enjoy! If you love delicious, buttery cake donuts topped with maple glaze, this cake is for you! It's a GIANT version of my favorite maple cake donut. Don't skip the maple candied pecans on top — they're so easy to whip up and incredibly addictive. 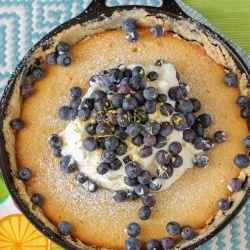 To make the cake: Preheat the oven to 375 degrees and prepare a 10-inch oven-safe skillet sprayed with cooking spray. In a medium saucepan over medium heat, bring the butter and water to a boil. In the meantime, in a separate large bowl, whisk together the cake flour, sugar, baking soda, and salt before whisking in the egg, sour cream, maple extract, vanilla extract. Mix to combine. While mixing, slowly pour in the boiling butter and water mixture. Mix to combine completely. Your batter will be very runny. Pour the batter into the prepared baking pan. Bake at 375 degrees for 17-22 minutes or until a toothpick inserted in several places comes out with a few moist crumbs. While the cake bakes, prepare everything to start your frosting. Make the icing: When the cake is fresh out of the oven, bring the sugar, butter, evaporated milk, and salt to a boil over medium-high heat (I use the same saucepan as before). Reduce the heat and simmer, whisking constantly, for 10 minutes. The frosting will bubble like caramel most of the time and you'll notice it start to pull away from the sides of the pan as it nears the 10 minute mark. Remove the icing from the heat and whisk in the maple extract. Pour the icing over the hot cake and spread quickly, because it begins to set immediately. 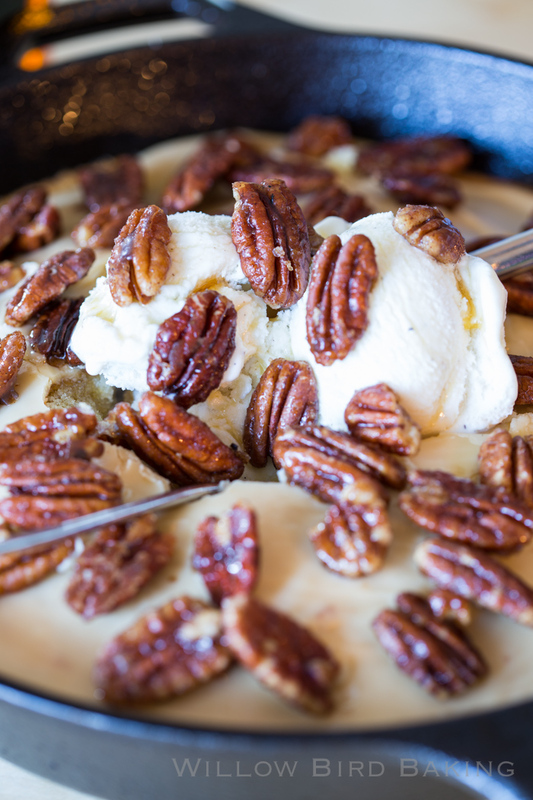 Top the cake with maple candied pecans. Serve immediately with vanilla bean ice cream and drizzled maple syrup. Oh my gosh, this looks incredible, I love maple! Oh my word! I want to dig in right now…or just face plant into that deliciousness! YUM! Oh my sweet heck, this cake. Girl, you know the path to my soul. Also, I think I need a life group in life. Seriously!! Found you as a fellow Mode contributor and so excited to discover your blog! Hi Pat! Welcome! My regular readers know the layout, so they can either read the story or just scroll on by. And now that you know it, feel free to do the same. My storytelling is just as important to me, if not moreso, than the recipe, so I choose the layout based on that. Thanks for visiting! Hi! 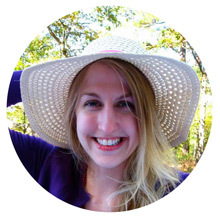 I have just discovered your blog and I love how genuine you are in in your writing. Your ‘Life Story Groups’ sound great fun and I couldn’t agree more, so often we only share what’s on the surface. It’s amazing where Pinterest will take you when you wander off the path. Beautiful writing and amazing looking recipes! I absolutely LOVE the storytelling idea. There are people at my church who are basically strangers. When I was in the sacristy one morning, two ladies told me that they were friends of Lady Bird Johnson’s and one had a photo of Lyndon & Lady Bird on the steps of my church many years ago as they attended her wedding. And when I lost my precious grandson, one told me she also had lost a child. These stories can create lifetime bonds, provide understanding of another’s demeanor, and definitely change the way you feel towards them. I am so happy this Easter Sunday to have found your blog! The ingredient list says maple extract for the icing, but the directions say almond. Please clarify. Thanks. I LOVE YOUR MAPLE BROWN SUGAR BRAID! Made it many times. Oops! Thanks for pointing this out. It should be maple! I’m so glad you enjoy the braid, Sherry! It’s one of my favorites, too! !